Hawk Quest reprises old-style, epic high adventure at its best. Although written on a grand, sweeping scale, human interest remains paramount and the pace never flags from start to finish; this is the work of a master storyteller. Fate directs the steps of Frankish outlaw Vallon when one autumn day in 1072 he encounters Cosmas of Byzantium while seeking shelter from a blizzard in the Alps. He reluctantly inherits both the dying magus' young Greek assistant and his commission to negotiate the ransom (set, in lieu of gold, at four rare white gyrfalcons) for an Anglo-Norman knight captured by the Seljuks at Manzikert. Vallon's intended path to Constantinople suddenly takes an unforeseen, danger-fraught detour through ravaged post-Conquest England, over the stormy northern seas to Iceland and Greenland and along the old Viking trade route across Russia to Anatolia. Vallon is a brooding loner, a man embittered by betrayal and suffering. Once a respected military commander, he's now just another sell-sword. However, the charisma and innate authority of a natural leader attract to his side an odd collection of loyal companions undeterred by his forbidding aspect. All have their own stories; some have hidden agendas. All will be tested. Not everyone will make journey's end. 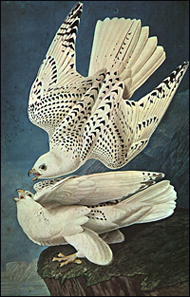 A Description and History of Falconry at the Wingmasters website.